How’s the new Character Locator app coming along? I’ve been tweeting images and comparisons to another popular app over the last few days as we complete work on the NEW Character Locator+ app Version 2.1568992317. Okay, that’s enough of the silliness. You guys want details, facts, cheeseburgers! The largest majority of the app and the programming are completed. I’m working on entering menus for all the Counter and Table Services locations for all Four Parks. I had NO idea that there are over 140 of those and it will take about 15,000 entries to complete that. I’m about half finished with the menus now. I can’t get the trained monkeys to stop eating the bananas and get back to entering data that I collected on my recent fact finding mission. It’s funny because I tweeted that I was working at the parks and people thought I was kidding. I’ve taken photos of every ride, show, character, dining location and menu in all four parks. Does that qualify me for a Wreck-it Ralph HERO award? I can tell you from my experience and the experience of 20 Beta Testers (who don’t have all the features) it’s going to be an awesome app. It loads MUCH faster than the Diznee apps. In WORST case scenario testing our app loaded in 7 seconds and the user gave up after 2 minutes with MDE. Our app will load in 1-5 seconds under park conditions, meaning it takes less battery. It also has ALL graphics and photos installed natively on the app, which means it won’t chew up nearly as much data. We are aiming for a May the 4th release date, so each day I will present another new feature of the app. Today we present PARK HOURS! Ta da! 1. 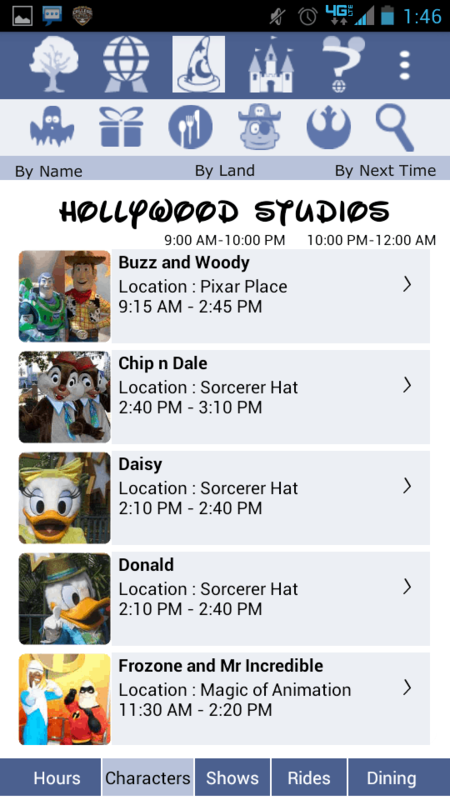 Park Hours including Extra Magic Hours – the new app contains Park Hours for 180 days for each park. We’re going to increase that to 210 so we can list them as they are first released. We update the hours each time Disney posts an update. Underneath the Park’s title you’ll see that park’s hours for the day. If there are Early EMH Hours, they will list to the left. If it has Evening EMH, it will show to the right. You can easily see that Hollywood Studios has Evening EMH tonight. Coming to Android Saturday, May 4th. Following up with iThing version afterward. I know people asked about an apple version in the fall of last year … Was wondering if there was any news… I love your site and hate paper planning out my meet and greets bc I can’t see the schedules on my phone. No set date, but we’re working on something. We began the actual build in February, so it takes a while for two guys with no prior training. However, it will be a great product when it’s available. Peggy, For the Android version, it will require a data connection but we pre-install the images in the app so that it will not require as much data. I tested on a very weak signal (Verizon 1x) and it only took 7 seconds to load all of the characters for Magic Kingdom. I think you will enjoy the new version. As for ithings it will be 100% web. Will it work without a data connection? Droid on May 4th, no set date yet for iThings yet. awesome! I just found you site, not sure how. But we will be there in June and can’t wait to give your app a try!